Private Estate Bottling Tour in Tequila | ¡VidaMaz! My favorite tour in the quaint pueblo of Tequila, Jalisco, is of Herraduras. The hacienda is beautiful, and the people are very welcoming and down-to-earth. I’ve generally avoided Cuervo, because I see it as such a machine. We have friends who love it, however, and they recently took us with them on a private bottling tour there. I HIGHLY recommend it! 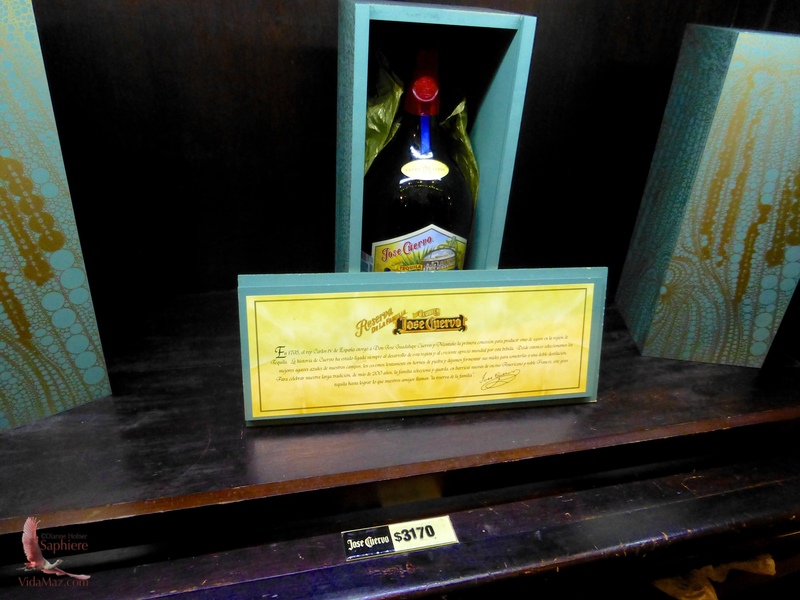 Firstly and most importantly, every person on the tour gets a bottle of La Reserva de la Familia. 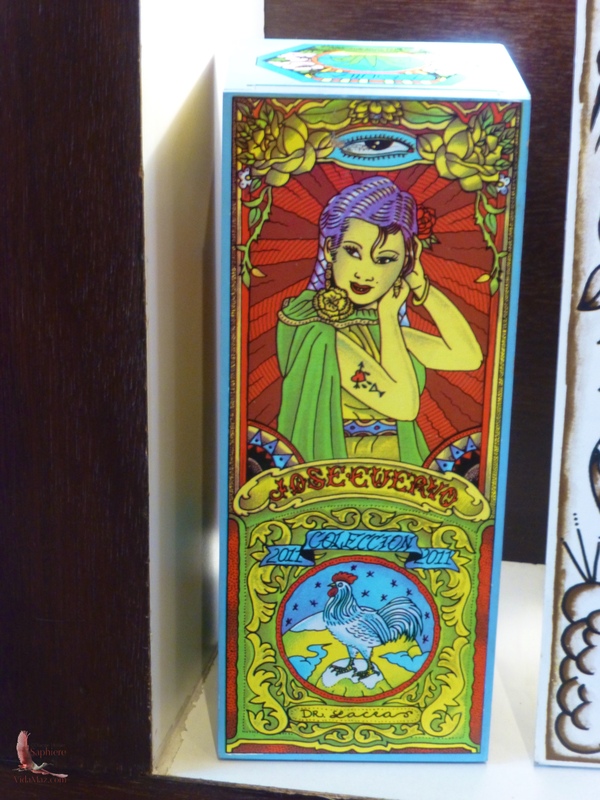 This is INCREDIBLY smooth and easy-drinking tequila, leaving no hangover, and comes in an annual collector’s box designed by the artist-winner of their annual contest. We paid LESS THAN THE PRICE BELOW for a six-hour day that included a tour of the fields, the hacienda and gardens, a tasting, snacks, and our private bottling! First let me show you what our day included, and then I’ll give you the scoop about what I learned about how to get the best deal. We started by getting into a van to drive out to the fields. Below are some photos of the demonstration we had there, where Ismael, one of Cuervo’s long-time jimadores, demonstrated to us how they uproot and trim a blue agave. Most of the hacienda tours will include something like this. Click on any photo to enlarge it or to view a slideshow. Next, we went back to the hacienda (not as old as Herradura, and we definitely felt it was more for show than to get work done in), and had a tour and explanation of the distilling process. In a group of about 30 people (it was a puente weekend), we saw the ovens, the tanks, the barrels. We sampled the leftover agave after it’s finished baking—it was good! Nice and sweet, sort of like sucking sugarcane. We also did a tasting of various tequilas out of the barrels. Again, most tours at most haciendas include something like this, and to me, Cuervo is not the prettiest hacienda. From here we broke off from the group tour and went down into the cellar, where we would have a private tasting of Reserva de la Familia. Now we became about ten or twelve people. Again, it was a puente weekend; I believe that on a regular weekend we would have been fewer people. The cellar was gorgeous—hard to take photos in, as it was so dark. We were allowed to drink pretty much all the Reserva de la Familia we could handle in the 30 or 40 minutes we were down there. Of course, we were already buzzed by the time we arrived in the cellar! My favorite part was that we were instructed on how to use a copper ladle (benencia or ladrón) to dip into the barrel and fill a brandy glass. This part was a whole lot of fun, and unlike any other tour we’ve taken. So, by now we’ve been “sampling” tequilas for about three hours, and this last cellar visit gave us the chance to sample the best of the best. Now we got to (try and stay vertical long enough to) climb up the stairs and go to a tasting. A TASTING? Seriously?! Oh my! This took place in a gorgeous room all set up special. We were joined by a few additional people, so we were maybe four family groups in all. Our terrific guide for the day, Rosy, taught us a bit about how to smell and taste three different tequilas (the brandy snifter in the photo below is my leftover Reserva de la Familia from the cellar! ), using a plate of tastes and smells (coffee beans, cinnamon, lime, etc.) to help us. Next we thankfully got a bit of a break, and even some fresh air! We walked out through the gardens, after which we sat down to eat a few of the snacks that were included in our tour. Our break took place in a gorgeous little courtyard, and we had a beautifully sunny day. To my memory (which by now is quite fuzzy), they tasted great. We enjoyed chatting and laughing with the kids who came by selling fresh-made bread and rolls. Finally we got to the BEST PART. We went back down into the cellar and got to bottle our very own private Reserva de la Familia bottles! We filled a clean bottle from the barrel. We corked it, wrapped it with tape so that it would be easy to open, then dipped the cork and tape into wax. You can tell by the photos below that my wax dipping didn’t come out as “clean” as it should have, but I sort of liked the artistic result. Once the bottles were corked, we had to glue on the labels. Somehow our guide felt the need to straighten each of the labels I put on; can’t imagine why that would be. Our estate bottle numbers were officially registered into a log book, and we were able to hand-letter a personal message on each of our bottles. LOVED IT! Finally, our bottles were wrapped in tissue paper and placed into the collector box, which is a different design every year. Once our six-hour, wonderful day finished, we were able to walk around the hacienda further, have another round of something to eat, and shop in the gift shop. Since we had four identical boxes, plus a fifth matching box at home, I asked Rosy if she wouldn’t trade me out for a different box. I’d spotted a cool Japanese woodblock print-looking rabbit box earlier. Sure enough, Rosy did me that favor, and now we have two different kinds of collector’s boxes. We stayed at a clean, bright hotel conveniently located right on the plaza, steps from the church, called El Jardín. You can see the affordable rates in the photo below. We were happy to spend the night in Tequila; we hadn’t done that on previous visits. As much tequila as we’d “tasted,” we were glad to have the hotel! The plaza at night was hopping, and we ended up with souvenir clay cups or jarras, which our bartender kindly filled with fresh fruit juice and tequila (because of course by then we were thirsty again). Thank you, Rosy! Thank you, Paco and Vero! Okay, so here’s my advice if you want to do this tour. First, go online and get your Mundo Cuervo membership card. This gives you all sorts of different benefits. Next, “like” Cuervo’s Facebook page. There they share a bunch of special offers, contests and discounts. We were able to have our membership card upgraded to one of the top levels, which allowed the two of us to get our six-hour day including everything above for just 2900 pesos! Of course, we also had champion negotiator, our friend Paco, do the bargaining for us. Even at normal cost of 1600 pesos, however, the bottling on its own is a good deal, but the total price we paid blew me away for everything we did. Tequila is a fun trip no matter what. Private bottlings require scheduling ahead of time, so if you want to do that, be sure to call ahead. I put this on our Bucket List for 2015! I’m confident you’ll enjoy it, Terry! Thanks for letting me know! From Mazatlan how did you travel to the Guadalajara or Tequila area? What would you recommend, flying or renting car, or bus?? We stay in Mazatlan for quite a few weeks so this would be a great trip. Dear Diana, we travelled by car, but you can easily go by bus. Renting a car would also work. Have fun! Dianne, how did you identify a tour guide? Did you take the guide with you from Mazatlan or did you meet the guide in Tequila? Mark, once you get to Tequila there are many guides; all the haciendas have them. Also, you can go onto the website for the distillery you want to tour (e.g., Cuervo) and reserve there. Does that help? I hesitate to publicly publish Rosy’s private number, but if you send me an email I can get it to you. She rocks.